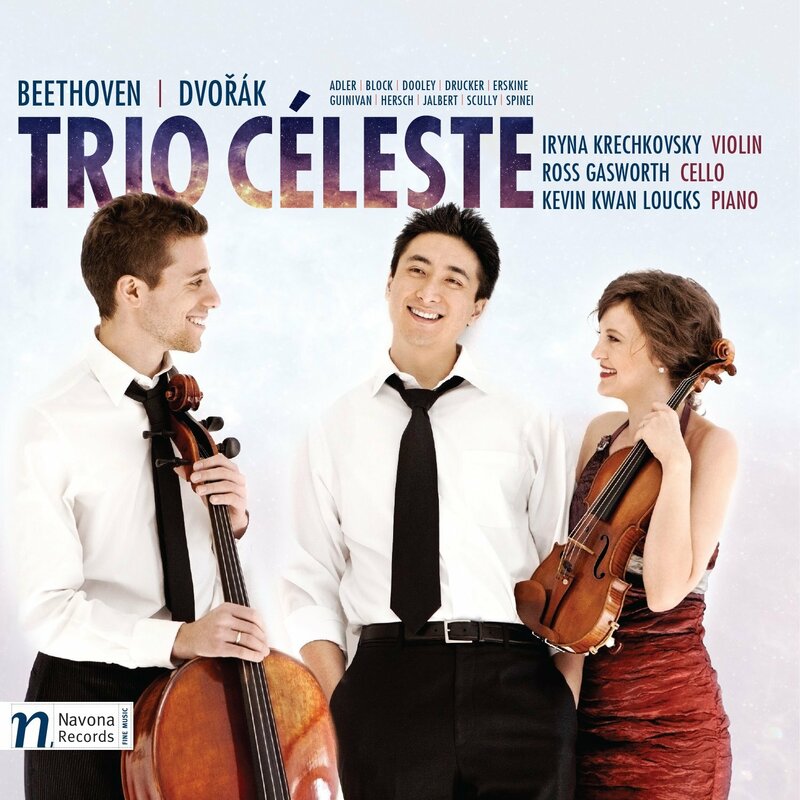 Trio Celeste is a young American piano trio (Iryna Krechkovsky, Ross Gasworth, Kevin Kwan Loucks), and on this eponymous disc from Navona Records they perform two classics of the piano trio repertoire, Beethoven's Piano trio in G major, Op.1 No.2 and Dvorak's Piano Trio No. 4, Op.90 'Dumky'. Rather than linking the two with a third classic work the trio instead include a set of variations commissioned from 10 contemporary composers. Based on the opening theme of the slow movement of Beethoven's trio, Constellations: Variations on a theme of Beethoven features short variations by Eugene Drucker, Mike Block, Eric Guinvan, Peter Erskine, Paul Dooley, Fred Hersch, Samuel Adler, Jim Scully, Christina Sinei and Pierre Jalbert. Beethoven's opus 1 piano trios were his first major work, and Beethoven was still writing in the piano trio form inherited from Mozart, where the structure of the piece was only beginning to be liberated from the earlier accompanied sonata. The piano is often still dominant here, and there is a long was to go to having the three equal parts of Dvorak's trio, though Beethoven's final piano trio, the Archduke, would show the way. In the Adagio of the opening, the interest is firmly in the piano with the violin constantly breaking free. The players all contribute a nice fine-grained tone and the balance is just right with not too much string tone, overall it feels quite HIP. The sprightly Allegro features creative dialogue between violin and piano. The elegant Largo con espressione is gently expressive with lovely sweet-toned line from the violin. Again the piano is rightly to the fore, but Kevin Kwan Loucks leaves space for the strings where required. The Scherzo is elegantly perky rather than rumbustious, whilst the final begins in busy fashion. At first the performance seems slightly lacking in drama, but then it builds up a nice head of steam. The 10 variations all demonstrate interesting aspects to contemporary composers' thoughts on writing for piano violin and cello. The composers have a wide range of ages (birth years from 1928 to 1984) and a similarly diverse approach to the piano trio problem. Eugene Drucker's Paraphrase uses rich, expressionist harmonies in a quiet, discreet movement. Mike Block's Musiqaw Largo has a sense of motor rhythm, with interaction between the instruments. Eric Guinvan's Ethereal is delicately transparent with fragments, cries and whispers. Peter Erskine's How Far a Lar Go is romantic, with a traditional feel to texture and melodic shapes. Paul Dooley's Variation for Solo Violin has a hard edged violin solo, but with more traditional fragments amidst the fury. Fred Hersch's Moonrise is rather modern romantic, with lush melodies and spiky harmonies, plus a sense of the piano accompanying the violin. Samuel Adler's Scherzo Variation uses the three instruments as equals within a complex polyphonic working out. Jim Scully's Wistfully Mischievous has rich romantic melodies and strong harmony. Christina Spinei's If Beethoven Danced Merengue is high energy with Latin American dance hints. Pierre Jalbert's Still Variation uses quiet sustained high note clusters to create something transparent. Dvorak's Piano Trio No. 4 in E Minor is a remarkable essay in alternatives to sonata form. Written in 1891 it uses the Czech dance form, the dumka, which alternates slow and fast, mixing brooding introspection with more manic elements. Dvorak used the dumka in a number of works but here he uses it in each movement (dumky is the plural of dumka). Each of the work's six sections is in dumka form with the first three forming a linked sequence, effectively the first movement. Each dumka section alternates the vibrantly passionate with the manic, but I wasn't sure that the trio had caught the brooding elements of the work and made enough of the contrasts between the movements; the dark moments just didn't seem dark enough. There is an elegance and clarity to their playing, with the Czech elements present but woven into the texture. This is an imaginative programme from a trio who bring a nice clarity and elegance to the music. Their support of contemporary composers is admirable.